Punch is a term originating from India for alcoholic and non alcoholic drink recipes made with fresh fruit and fruit juices. It is usually served in a large bowl, commonly known as a punch bowl, at festive gatherings. Fruit punches are often mixed with non alcoholic mixers, such as iced tea, carbonated water or sodas and even with coconut cream or ice cream. Some punches, such as Hawaiian Punch, originated as a nonalcoholic punch. Punch has some of its earliest roots in India and was later introduced to England in the seventeenth century. In England, punches were referred to as Wassail, a type of mulled cider made with wine or other types of alcohol and served as a hot beverage. It was also served as a non alcoholic punch recipe made with a cider base. Wassail flowed with cheer during the winter holidays, and the spiced punch was offered as a gesture of good will to holiday guests and Christmas carolers. Not long after, Jamaican rum was introduced to the world scene, and a variety of Caribbean punches, such as Caribbean rum punch and planter's punch, became very popular. They continue to be popular to this day. Punch is a favorite beverage served at festivities all around the world. There are a variety of regional punch recipes throughout Europe, Asia and the United States. Whether it is served hot or cold, punch has stood the test of time and continues to be the refreshment of proverbial greeting around the world. If you are looking for Hawaiian non alcoholic drink recipes, this tropical punch recipe is refreshingly pleasing for all age groups, and it makes an ideal refreshment for group gatherings. Garnish your punch bowl with visually appealing fresh fruit, Hawaiian flowers and paper umbrellas. Fit an ice block or ring into a 6-quart punch bowl. 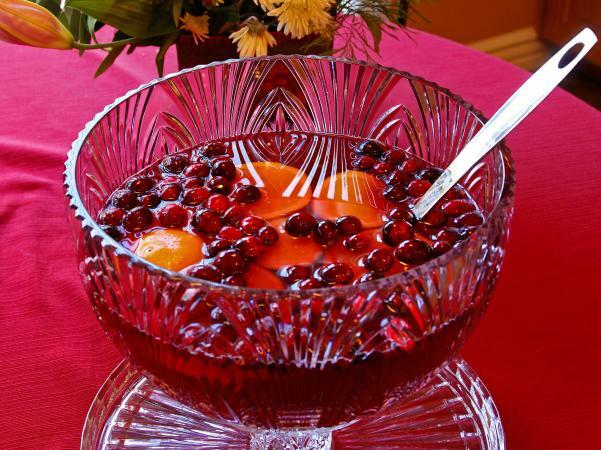 Mix all ingredients into the punch bowl, except for ginger ale, grenadine syrup and fresh fruit. Stir well. Add grenadine to taste. Chill the punch bowl in a cooler for several hours. Garnish Hawaiian punch with fresh fruit, such as pineapple spears, maraschino cherries and orange twists. Garnish the area around the punch bowl with fresh tropical flowers and paper umbrellas. When you're ready to serve the Hawaiian punch, add the ginger ale and stir. The people of the Caribbean Islands sure know how to make enticing Caribbean Rum Punch with fruit juices, but an island punch is equally refreshing when served as a non alcoholic beverage. This non alcoholic punch recipe derives from the historic Caribbean Punch made with rum - Planter's Punch. Serve this delightful island punch in chilled glasses or a glass pitcher. Combine juice ingredients and crushed ice into a cocktail shaker. Shake and strain punch into a highball glass. Add angostura bitters to taste. Pour in a dash of soda water and garnish with fresh mint leaves. Half the fun of making a big bowl of punch is adding the garnish. Try experimenting with different exotic fruit and berries for a fun summer punch. Garnish hot winter punches with spices like cinnamon or star anise, or add fresh citrus slices or cranberries. Garnishes, such as paper umbrellas and tropical flowers add flair to a festive punch. These finishing touches make your punch as pleasing to the eyes as they are to the palate!